Instruction lines or e.g. conditions of loops or alternatives may get pretty long if the involved expressions are complex. 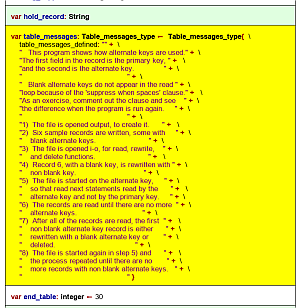 This may lead to a very wide diagrams, which compromise overview and manageability. 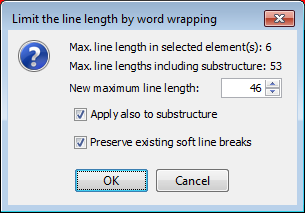 Since version 3.27, you may effectuate a "soft" line break by splitting a long line into several lines and placing a backslash at the ends of all of them but the last one. On code import, however, it can easily become a horrible task if there are lots of overlong lines. There is a new import option that allows to force the automatic insertion of such "soft line breaks" as soon as the configured maximum line length is going to be exceeded (see Import options). 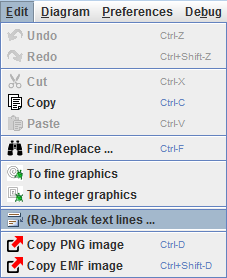 A new menu item in the "Edit" menu allows to re-adjust the text lines of just a selected span of elements of a diagram (and possibly their substructure elements) with a new length limit. This approach (the second opportunity in particular) allows not only to mend the result of a forgotten length limit on code import but also to apply different length limits to different parts of the diagram. Elements neither selected nor being part of the subtree of a selected element are not affected, nor has a readjustment of the lines any impact on other diagrams or elements added later to the diagram. At top it shows the detected maximum line lengths in the selected range of elements, both for the directly selected elements (flat retrieval) and with all substructure of the selected elements included ("deep" retrieval). Now you are to specify the new line length limit via the spinner control, to decide whether only the selected elements themselves are to be affected (flat mode) or their embedded sub-elements as well (recursive or deep mode). Last but not least you may specify to respect the currently placed soft line breaks (backslashes at the line end); this makes only sense if the new length is less than the current maximum length, otherwise there wouldn't be any change. You see that the line breaking is actually a word wrapping taking into account the syntactic structure of the line. Literals or names will never be split.